Cooking With Martha... Not Stewart, nor Muffins! | What Smells So Good? This past New Year's eve was shared at my dad's house this year, which is always a fun adventure in any case. Usually it's a dinner and movie-style evening, though this "party-ette" had an added element of Disney Scene-it added in, which I of course won by a landslide! I shouldn't say "of course" in this case, though, since it's usually Teaghan who takes the cake in that competition! One of the firsts that we had as a family that night was baking rice pudding. Martha had never made it ever, my dad loved it but hadn't made it himself, and though I had made it before, it was always stovetop. Andrew had sworn off rice pudding since an unexplained childhood incident, but we were all ready to tempt him into it! This is the recipe, from 'Better Homes & Gardens 'New Cookbook', which is the cookbook that has been my bible for over twenty years. I couldn't find a publication date, but it is over twenty-five years old. 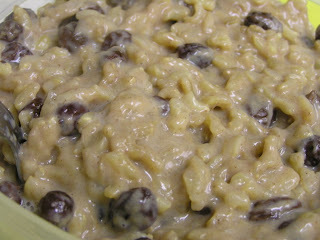 In bowl, combine eggs, milk, rice, sugar, raisins, vanilla, and 1/2 teaspoon salt; mix well. Bake in 10 x 6 x 2 inch baking dish at 325 for 25 minutes. Stir. Sprinkle with cinnamon. Continue baking till knife inserted halfway between center and edge comes out clean, 20 to 25 minutes longer (because of the 1% milk, we wound up cooking it about 40 minutes the second time. Do the "jiggle test" for custards if you're unsure). Serve warm or chilled with light cream, if desired. What I did was put probably 2 cups of rice in and more like 2/3 cups raisins. I didn't put the salt in because I figure we get enough sa lt in our diets already. If it tasted okay I really wouldn't know, because I have never made it before, and I have eaten it about twice before in my life. Perhaps it was just the combined ingredients of making something that someone really enjoys (your dad), Andrew's slightly beaten eggs, and your expertise of what it should look like, (whatever the extra time was!!). I think that is a wonderful recipe really. Everyone contributes and appreciates the efforts of all involved. Sit back and enjoy each others company..........aaaahhhhhhh. If it were just that easy..........or, perhaps it really is!! Thanks, Martha, you're one of the most inspirational and emotionally uplifting, not to mention interesting, opinionated and fun people I've ever met! I'm so glad my dad has you in his life! I love rice pudding, not had it for years though, and this looks really good and so easy too! Happy New Year to you!! Rice pudding is my dad's favourite dessert. It is wonderful to get the whole family involved in the cooking process. Have a wonderful 2008! !